This Workbook covers all of the new syllabus requirements and is designed to be used with DVD #2. Using this Workbook in conjunction with DVD #2 will save teachers hours of lesson preparation time and provides an efficient and professional presentation - which today’s students relate to, appreciate and expect! All 8 modules are provided in this easy to use Workbook. This Workbook is set out in a simplified dot-point form so that students can annotate it in class and then use it as a well ordered study summary of the history, scope and impacts for all modules. The Workbook provides students with an inexpensive method of recording all syllabus requirements in one manageable booklet for study purposes .... without having heaps of handout sheets that students generally find difficult to organise and use. 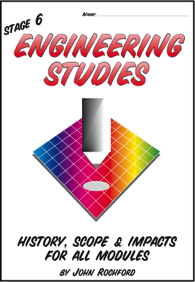 Package offer: Purchase the set of 4 Engineering Studies Workbooks for $77 - a saving of over 30% on the RRP.